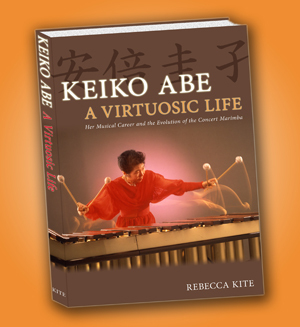 "Keiko Abe: A Virtuosic Life is an inspirational biography that reveals Abe's monumentally important contribution to the marimba. Steeped in the large landscape of music history, Rebecca Kite expertly captures the many tightly woven threads of Abe's spellbinding life story. Designed as both a biography and a history of the instrument, its music, its composers, and its musicians, no other book in our era -- like Keiko Abe herself -- has done so much to advance the marimba and the field of percussion on the world stage." Keiko Abe entered my life at the 1981 Percussive Arts Society International Convention held in Indianapolis, Indiana, where I first met her, heard her rehearse, and saw her perform. On the strength of that initial meeting, and especially after seeing her perform, I signed up for a five-week intensive class with Abe, conducted in the city of Utrecht in the Netherlands, four years later.